One day while on the highway we got a glimpse of a big Thai-style jedi which is being constructed. 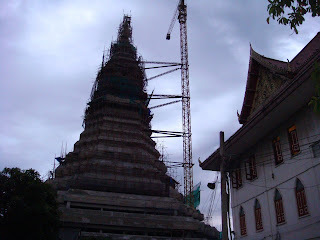 A few days later we were told that the construction project belonged to Wat Paknam, Pasicharoen. This afternoon Yontan and I got a chance to be there. The first sight of the jedi brought so much joy. The foundation stone was laid on August 27, 2004. 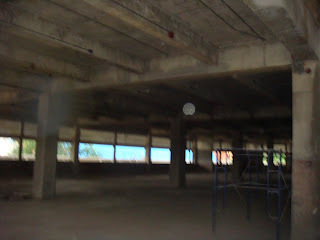 The base is 51 x 51 meters and the height is 80 meters. The base or the ground floor is used as a parking lot; the other four stories would house Buddha images and are used for meditation and other purposes. The upper part from the dome to the pinnacle constitutes the main part of the jedi. 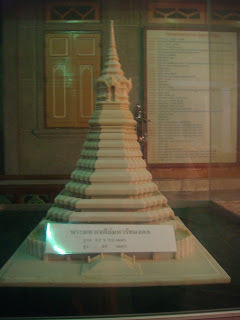 It’s constructed according to Lanna style.